Who invented the Telegraph? The name of the person credited with inventing the Telegraph is Samuel Morse (1791 - 1872). Samuel Morse is not only famous as the American inventor of the Telegraph but also as a portrait artist, entrepreneur and businessman. When was the Telegraph invented? Samuel Morse invented the Telegraph in 1838, during the First US Industrial Revolution (1700 - 1860) period of invention. The invention of the Telegraph originated in America and is considered a highly influential achievement in the field of Communications. Definition of the Telegraph: The Telegraph is defined as an apparatus used to communicate at a distance over a wire, usually in Morse code and transmitted by electrical action in order to send cables, wires, or telegrams. Fact 2: Who invented the Telegraph? Prior to the invention of the Telegraph in 1838, there was a non electric telegraph which was invented by Claude Chappe in 1794. Claude Chappe's system used a visual system called semaphore (a flag-based alphabet) that depended on a line of sight for communication. Fact 3: Who invented the Telegraph? The inventor of the Telegraph, Samuel Morse, was born on April 27, 1791 in Charlestown, Massachusetts, United States and died on April 2, 1872. Fact 4: Who invented the Telegraph? Samuel Morse was galvanized to such an extent that he was destined to become esteemed as the American inventor of the Telegraph. Fact 6: Who invented the Telegraph? In 1810 Samuel Morse graduated from Yale College and returned to Charlestown, Massachusetts. Following his education his first job was as a became a clerk for Daniel Mallory, his father's Boston book publisher. Fact 8: Who invented the Telegraph? In October 1816, Samuel Morse returned to the United States and opened an art studio in Boston. Samuel Morse was an intelligent and extremely well educated and his interests included the many inventions that were being made at the start of the Industrial Revolution. In 1817 Samuel and his brother Sidney patented an invention for a man-powered water pump for fire engines. Fact 9: Who invented the Telegraph? On September 29,1818 Samuel Morse married Lucretia Pickering Walker in Concord, New Hampshire. The couple had three children but Lucretia died on February 7, 1825. Samuel Morse married his second wife, Sarah Elizabeth Griswold on August 10, 1848, in Utica, New York and the couple went on to have four children. Fact 10: Who invented the Telegraph? Samuel Morse made a name for himself as a successful portrait painter. His portraits included paintings of Eli Whitney and the Marquis de Lafayette. Still interested in new technology and inventions he made a three dimensional marble-cutting machine in 1822. Fact 11: Who invented the Telegraph? Samuel Morse mixed in elite circles with famous men of the day and kept abreast of the latest scientific inventions and discoveries. He was particularly interested in electricity and electromagnetism. Fact 12: Who invented the Telegraph? In 1832, Samuel Morse first conceived his idea for the invention of an electromagnetic Telegraph and by 1835 had constructed a recording telegraph with a moving paper ribbon. Fact 13: Who invented the Telegraph? Samuel Morse then started plans to create "relays," where one electric circuit is used to open and close a switch on another electric circuit that was located further away. Samuel Morse had found a way to use the flow of electric current to make a code that could be sent along the wires. Fact 14: Who invented the Telegraph? He went on to realize that if a man at one end of a line of wire pressed down a key (the sender), electricity could be made at the same moment to automatically press down another key at the other end of the line of wire to the receiver and marked by the receiving machine on a moving strip of paper. Fact 15: Who invented the Telegraph? Samuel Morse invented the Morse Key that could create short and long bursts of electric current (called pulses) using long or short taps on his Morse key machine. He then needed to create a code that could make impressions on the moving strip of paper. Fact 16: Who invented the Telegraph? Samuel Morse, working with his assistant, Alfred Vail, realized that if the man at one end of the wire held his key down for only an instant, this impression would look like a dot. If the key was held down longer, it would look like a short dash. Fact 17: Who invented the Telegraph? The dots and dashes were combined in a number of different ways so as to represent the letters of the alphabet and the Morse Code was born. Additional combinations of dots and dashes were added to the code to represent numbers. Fact 18: Who invented the Telegraph? The invention of the Telegraph and the Morse code made it possible for messages to be sent over long distances, however, the first test of the telegraph and code was sent across two miles (3 km). Fact 19: Who invented the Telegraph? Samuel Morse sent the first telegram on 11 January 1838, across two miles (3 km) of wire at Speedwell Ironworks near Morristown, New Jersey. The first message read "A patient waiter is no loser"
Fact 20: Who invented the Telegraph? Samuel Morse then demonstrated his system to a rather skeptical Congress. He sent telegraph messages between the Senate and House but it took a few years before Congress would fund the telegraph system. In 1843 congress provided funds of $10,000 and the first telegraph line ran for 30 miles from Washington, D.C., to Baltimore, Maryland. Fact 21: Who invented the Telegraph? The invention of the telegraph coincided with the construction of the railroad across America. The telegraph system carried signals across the land by lines (wires) supported by telegraph poles. As the land was cleared for the railroad it was easy to set up poles to carry the telegraph wires. Fact 22: Who invented the Telegraph? On May 24, 1844 a telegraph message was sent by Samuel Morse in Washington to Alfred Vail at the Baltimore and Ohio Railroad. Alfred Vail in Baltimore sent the message "What is the news from Washington?" Samuel Morse replied by telegraphing political news from the capital. Fact 23: Who invented the Telegraph? By the Civil War (1861 - 1865), the telegraph had become indispensable and Portable Telegraph Units were made for use on battlefields.. By 1861, telegraph lines crossed the American continent and by 1866, the transatlantic cable connected America and Europe. Fact 24: Who invented the Telegraph? 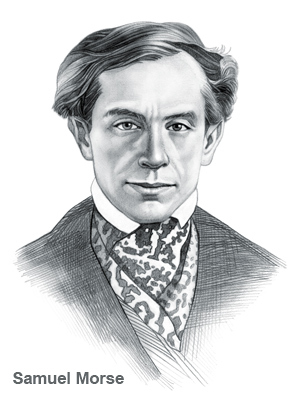 Samuel Morse died on April 2, 1872 and was buried at Green-Wood Cemetery in Brooklyn, New York. He will always be remembered in history as the inventor of the telegraph.